Nationally, the post-recession recovery has been described as weak and sluggish. This has affected new businesses attempting to grow in a slow-growth environment and facing a constrained supply of credit., The U.S. as a whole, and even metros such as New York, Boston, Chicago, and Silicon Valley, have seen persistent year-over-year declines in their regional share of new firms. However, the St. Louis region’s commitment to supporting and developing their entrepreneurs has allowed them to buck the trend and register significant growth in this area. In 2009, St. Louis start-ups accounted for only 6.6% of regional firms whereas by 2014, this number had risen to 9.7%. The number of new firms grew from 3,582 in 2012 to 4,266 in 2013 and to 4,876 in 2014, registering growth rates of 19.1% and 14.3% respectively. This success was recently noted in a piece in the FiveThirtyEight blog that declared St. Louis, “The New Startup Frontier.”  Citing St. Louis’ makerspaces, accelerators, co-working spaces, and regional commitment to expanding the startup ecosystem, Popular Mechanics named St. Louis the Number 1 startup city in America in 2015. Accelerators and venture funds such as SixThirty, Prosper Women Entrepreneurs, Yield Lab, Stadia Ventures, and Arch Grants; incubators such as T-Rex and Helix Center; and a burgeoning innovation district (the Cortex Innovation Community) are all working to support the startup community. This entrepreneurial culture has yielded investments in regional startups totaling over $1 billion in the last three years. St. Louis has expanded access to startup capital and extended significant resources in order to create an attractive environment for entrepreneurs. Accelerate St. Louis, an initiative formed through the partnership of the St. Louis Regional Chamber and the St. Louis Economic Development Partnership, was created to strengthen innovation in St. Louis. The mission of Accelerate St. Louis is to accelerate the growth of regional entrepreneurship, connect and support entrepreneurs, and raise awareness of St. Louis’ innovation ecosystem. In addition to the daily entrepreneurship and innovation events happening in the region, St. Louis will be celebrating Global Entrepreneurship Week with the rest of the world. During one week each November, people in 160 countries organize events and competitions to inspire entrepreneurship. While the official celebration spans one week, it’s no surprise that St. Louis’ entrepreneurial ecosystem has planned a full month of activities. From galas and hackathons to workshops and pitch events, there’s something for everyone. Accelerate St. Louis has assembled a list of the events planned. Pick one (or all 16) to attend and discover St. Louis’ entrepreneurial community and startup companies that are stimulating economic growth and reinvigorating St. Louis. “Seven Years Later, Recovery Remains the Weakest of the Post-World War II Era” The Wall Street Journal, Jun. 29, 2016. “Report to the Congress on the Availability of Credit to Small Businesses” The Board of Governors of the Federal Reserve System, September 2012. Defined as firms of age 0, divided by total businesses in a given region. “Business Dynamics Statistics – Firm Age by MSA” U.S. Census Bureau, 2014. “St. Louis Is The New Startup Frontier” FiveThirtyEight, Sept. 12, 2016. “The 14 Best Startup Cities in America” Popular Mechanics, Feb. 4, 2015. 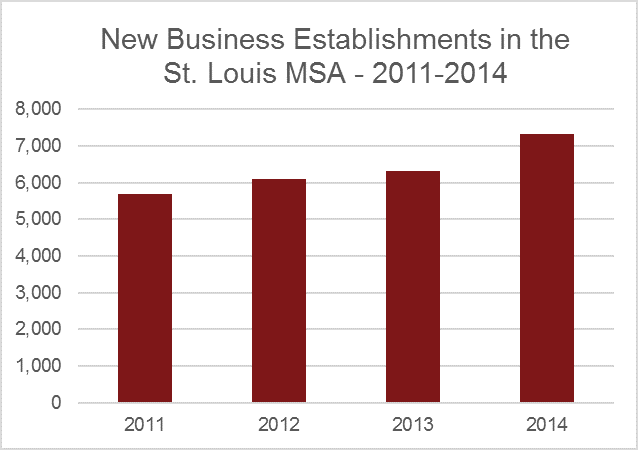 According to St. Louis Regional Chamber’s internal venture capital database. “Business Dynamics Statistics – Establishment Characteristics by MSA” U.S. Census Bureau, 2014. "Establishment Births, Deaths, Expansions, Contractions, and Constants by State, County, and NAICS sector: 2012-2013" U.S. Census Bureau.